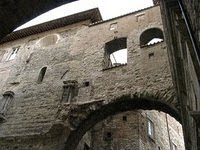 Perugia is famous for its medieval alleys and beautiful panoramas, and this past Saturday two groups of Umbra Institute students got a chance to see some of the city’s other hidden treasures on staff member Zach Nowak’s Nooks & Crannies Tour. The group braved the bitter cold (warmed only slightly by the January sun) on an hour and a half long traipse about town. Nowak recounted episodes from Perugia’s past (“The Alunni Orphanage,” “Dumas and the Sangiovese Wine,” and “The Salt War and Bad Bread”), underlining the fact that he never lets truth get in the way of a good story. Umbra’s extracurriculars continue this Thursday with winetasting.